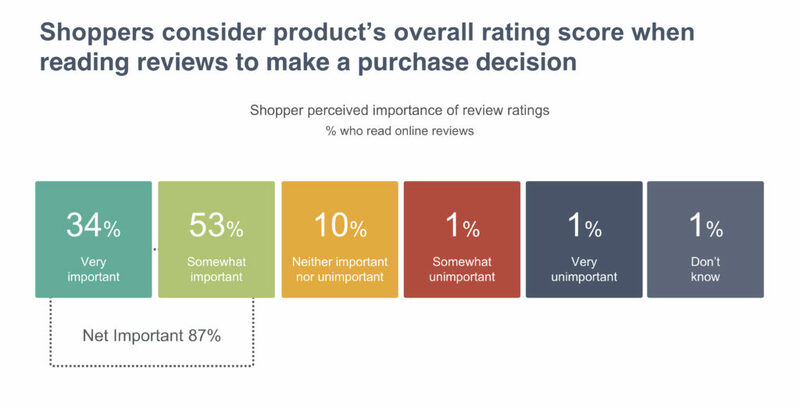 Shoppers don’t skim through product reviews but go over key aspects of a review before making an informed purchase decision. One of the key aspects shoppers look out for is the product’s overall rating score. Overall nearly 9 in 10 (87%) shoppers consider product ratings as important in making a purchase decision. More than a third (34%) of shoppers say the overall rating score is very important and more than half (53%) say it is somewhat important. Ratings are a convenient way of getting a quick opinion on a product or brand without having to read through multiple positive and negative reviews. 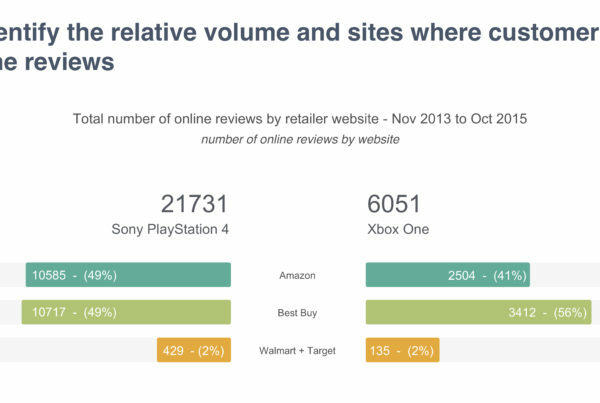 Ratings motivate shoppers to continue further with their research and read some of the reviews in more details. In fact, 9 in 10 shoppers go on to read the review content and even say that the content plays an important role in shaping their purchase decision. More than two in five (41%) shoppers consider the content of a review as very important. 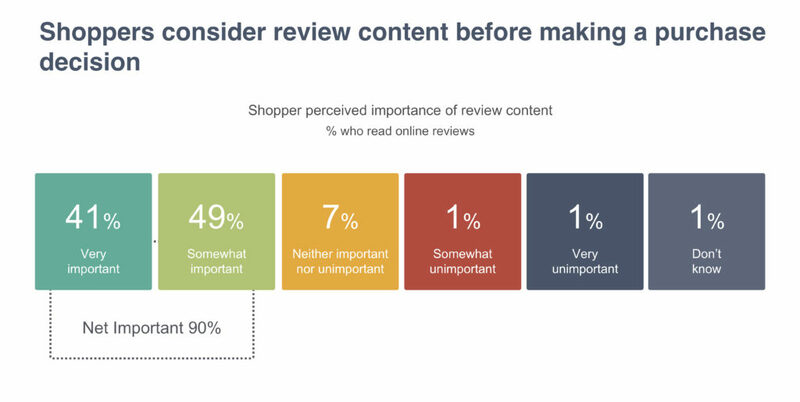 Nearly half (49%) of all shoppers consider the content of a review as somewhat important. The content section, while wordy, provides detailed information on the experience of previous customers. 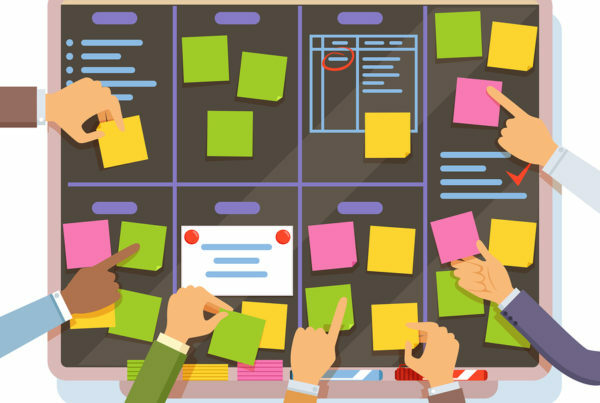 Shoppers can gather information to clear any doubts they have about the product, develop a better idea of what they can expect from it, and even consider looking for add-ons that improve a product’s experience based on the information shared in online reviews. For many customers a combination of ratings and content seals the purchase decision. Hence it is vital for brands and retailers to monitor the rating score of most recent reviews as well its content on a near daily basis. While brands shouldn’t remove any negative ratings and reviews, they can monitor reviews to keep an eye out for any sign of growing discontent among their customers before it turns into a crisis. One of the ways to do so is to look for common themes among negative reviews such as poor customer service or a faulty product.